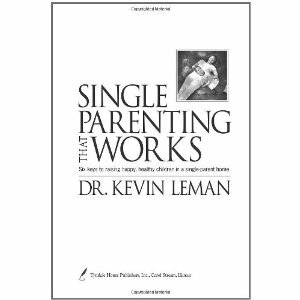 Single Parenting That Works: Six Keys to Raising Happy, Healthy Children in a Single-Parent Home by Kevin Leman is one of the few single parenting books out there that offers a comprehensive guide that draws on years of knowledge about how to raise your child as a single parent in a biblical focused way. The task of being a single parent need no longer be as daunting as people up until now have come to expect it to be. In this book you will be provided with insight into a variety of topics related to the theme of single parenting. An important aspect of a healthy and stimulating home is stability. Children need stability in their lives in order to develop in the best way possible. The first step is to achieving this is to get your own life in order. You cannot provide stability for your child if your own life is in chaos. In Single Parenting That Works you will be given the insight you need to achieve this aim. An important part of having a healthy relationship with your children is being able to forgive. Forgive them for what they do and teach them to be forgiving themselves. Forgiveness extends past your immediate relationship with your children. You need to be able to forgive yourself and not blame yourself for your situation like so many single parents are inclined to do. To learn how to forgive and build good relationships, read this book. An important part of being a successful parent is knowing how to deal with your ex effectively. There is no point in being harsh and angry with them when you need to deal with them. It is better to be God-centered in your approach and to treat your ex “with an olive branch rather than a hammer”. Your interactions with your ex will affect the adjustment of your children. In Single Parenting That Works you will be taught how to deal with this key problem. The issue of if and when you should start dating again or perhaps even get remarried is addressed in great detail. This is a very tough question to address and therefore requires a lot of attention. The most important thing that this book will teach you is how to ensure that your children thrive in your single parent home. This is of course what you want the most from a book on parenting and with this great read you will be provided with all of the resources and information you need in this regard.